Before we address ROI specifics, it is important to understand that you cannot track 100% of your leads for any type of marketing, especially digital. If anyone tells you they can track 100% of your leads, they are not being truthful, or they don’t know enough about digital marketing to know the difference. So, how do you track the success of your digital marketing services in a way that filters out the WOM and focuses on the benefits your digital marketing agency brings to the table in terms of your online visibility? For purposes of this newsletter, we will focus on patients or customers that do not know you and who have not received a WOM referral, but instead, have found you by searching online for information about procedures or services and for a doctor (or other type of business) who will provide them. Google Analytics (GA) is the Holy Grail for tracking digital marketing ROI. Many digital marketing companies only provide insights into the superficial layers of GA, because they do not understand how to use the more advanced functionality. 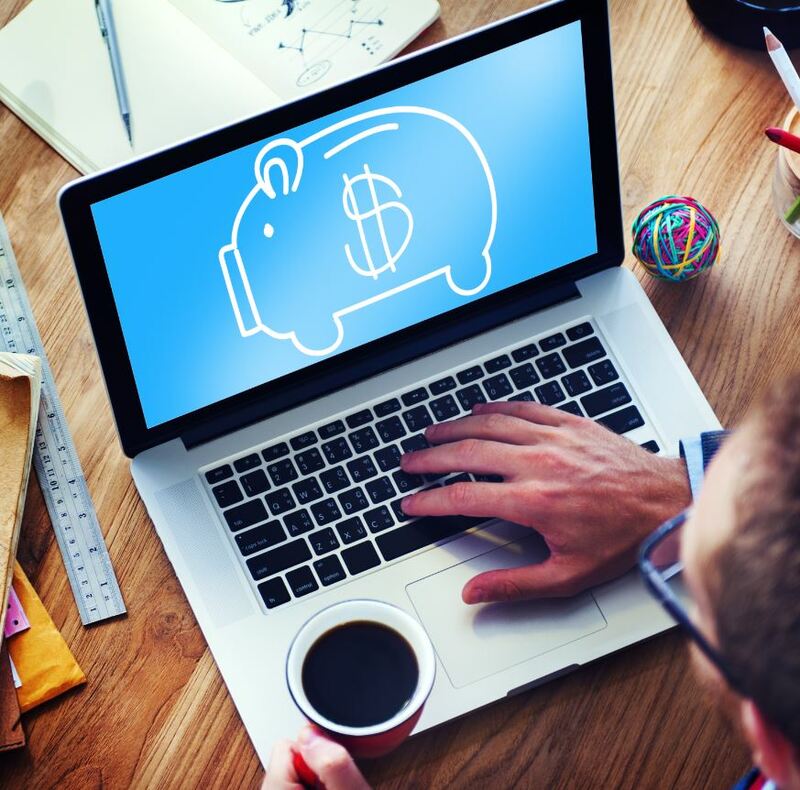 The more advanced functionality is where the treasure lies in terms of understanding ROI. While overall traffic is a good and important measure, it should not be the focus of tracking digital marketing success or your ROI. Most practices or companies hire digital agencies to promote revenue-generating procedures or services in a specific geographic region. Overall traffic does not provide any information as to which visitors come to your website from your region or which are visiting the money-making pages of your site. That being said, there are two “overall” metrics, time-on-site, i.e. how much time visitors are spending on your site, and the number of pages visited, i.e. the average number of pages being viewed on your site by each visitor, that are important and should be above a certain number. The time-on-site should not be below a minute and the number of pages visited should not be below 1.2 (give or take). These results will show you the location of visitors who come to your website. Once you choose a location(s) to review, set the date range and determine if your agency has been effective at creating more visitors from these locations during their contract period. These results will show you, in order, the pages on your site that garner the most views. You can then click on a specific procedure or service page, set a date range, and determine if your agency has been effective at driving the desired types of visitors/specific traffic to those pages. Once the goals are set up, you can then determine the source of your most important revenue-producing visitors and track the success of your agency. Please contact us if you would like to learn more about how to use Google Analytics to help evaluate the success of your online strategies. Background: One of the major goals of any Internet marketing strategy is to drive potential patients and consumers to your website, and within the website, to the pages that describe and promote high revenue-producing procedures or services. It’s also important to note that Google ranks website pages, not just websites. This means that your SEO should be structured so that individual pages of your site rank for search terms related to the high revenue-producing procedures or services. If someone types in a search phrase in hopes of locating procedure information in a given geographic market (e.g., “breast augmentation sacramento,” “dental veneers charlotte” or “cataract surgery ft worth”), it is imperative that the specific page on your website related to this procedure appear in the search results, not your home page. When visitors have to look for, or navigate to, this type of revenue-producing information on your site, they bounce back to Google and visit a different site that makes the information easier to find. This poor engagement by users can seriously damage website rankings, as well as conversion. Most SEO companies do not understand this issue. They take a simplistic approach and optimize the site without targeting the pages appropriately for each specific procedure. With unskilled SEO companies, the homepage often ends up ranking for the procedure-related search terms, and this spells D-I-S-A-S-T-E-R. When this happens, website visitors (i.e., potential patients) have to navigate to another page to find the information they originally searched for. The result is Poor Engagement that Hurts Rankings. And as if this weren’t bad enough, rankings for the homepage suffer as well. The homepage is just too generic and does not include enough specific procedure information to be considered a top resource by Google for that specific procedure. When the homepage is structured by the SEO company to rank for a wide range of procedure terms, it sends Google the wrong message. Problem: This month’s case study involves an eye care practice in Ft. Worth, TX that came to Ceatus with a big problem. Due to the use of amateur SEO techniques, the practice’s homepage ranked for eye-care-procedure search terms. 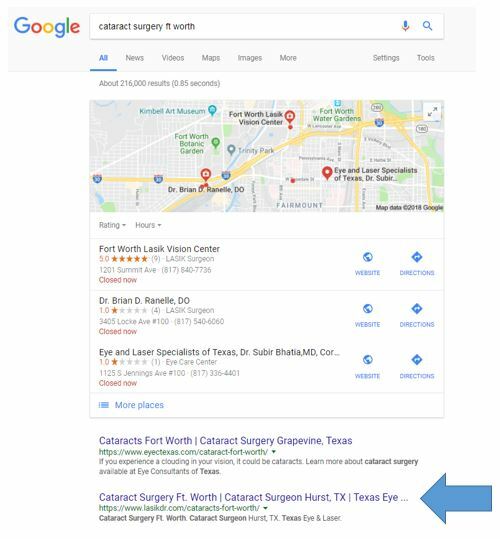 Although the site did have a specific page about cataract surgery, unfortunately this was not the page that Google recognized for the term “cataract surgery ft worth.” Instead, it was the homepage. Their practice marketing manager became very frustrated that the site never moved above the bottom of the first page of the Google results. She could not understand why the rankings stalled. The practice’s SEO company at the time tried to convince her that nothing could be done to improve the site’s rankings, traffic and patient flow. Fortunately, she didn’t believe them. Solution: Enter the SEO expertise of Ceatus Media Group. Our team educated the practice as to why their rankings were stuck at the bottom of the first page of the search results, and explained that the SEO had to be completely redone to “teach” Google which page should rank for each of the various procedures — i.e. show Google which page was the best consumer resource for each procedure search term. In this particular case, the practice website had to be restructured so that all of the ranking signals on and off the site were pointed to the correct procedure pages. Results: A month after their new Ceatus-designed SEO strategy was launched, the site’s Google rankings improved so that the correct pages now ranked for the appropriate procedure-specific search terms such as “cataract surgery ft worth.” Over the next four to six weeks, the site achieved Top 3 rankings in Google search results, and the rankings are still improving. So what happened with the cataract page? Because the page is now dedicated to and totally focused on cataract surgery, conversion has increased, the bounce rate has fallen and, most importantly, patient flow and revenue from the website have increased. Now, patients interested in cataract surgery in Fort Worth land on the correct page. They no longer have to navigate to other pages on the site to learn about cataract surgery. And, the page has a much better chance of getting to #1 in Google’s search results for the procedure search terms, because each of the other procedure pages has detailed information (and thus is a great consumer resource) on the appropriate procedure. Contact us if you would like to learn more about generating more revenue from your website visitors. Q: I heard there was a major Google algorithm update. Is this true? A: Yes, Google rolled out an update in August and September 2018 which has been dubbed the “Medic” Update by the Internet marketing community. It’s called Medic because a lot of health care sites were affected. The major components of this ranking update relate to Expertise – Authority – Trust, or E-A-T. All aspects of your online presence need to tie into E-A-T to take the most advantage of the recent Google algorithm changes. Call us today at 858-454-5505 or email us at contactceatus@ceatus.com if you would like to learn more about E-A-T.
See how you can grow your practice by visiting CEATUS at booth 4113. We look forward to increasing your conversion rate and bringing new patients to your door! Not attending GNYDM? Give us a call (858-454-5505) for a FREE Marketing Strategy Evaluation! Stay Tuned for More Shows in 2019!